Simple cigar humidors aren’t at all difficult to build. 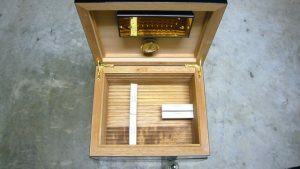 Not only will you save a little cash by building a DIY cigar humidor, this project also happens to make a thoughtful, one-of-a-kind gift for others who appreciate cigars! Luckily for those who don’t have access to a fully equipped shop, it’s possible to make a humidor from a high-quality cigar box. We’ll cover the entire process in a moment. Before you get started, there are some additional elements you’ll need to obtain. In addition to a fine cigar box for the outside of your DIY cigar humidor, you’re going to need a bit of cedar for the inside. It’s best not to replace this with other materials, since this particular type of wood is absorbent. It’s essential for keeping your cigars fresh and tasting their best. You can order thin cedar planks online if you can’t find them in your local building supplies store. While most DIY humidors call for Spanish Cedar, you can use American or Canadian red cedar in a pinch. Only do this if you don’t plan to keep your cigars in the humidor for long. When stored with red cedar rather than the Spanish variety, cigars can take on an unpleasant woody taste that completely ruins the smoking experience. Humidity controllers such as Boveda, designed to stabilize the humidor’s storage environment and optimize it to keep tobacco fresh. These can be ordered online in multi-packs. You can also find humidor kits that include a humidifier and a hygrometer. These can be found in some cigar shops, but you’ll save time by purchasing online. 1. Choose a premium wooden cigar box to use for your humidor. Do not get one with a slide-type lid and avoid boxes that are covered in paper. If you have a local tobacconist, you may be able to purchase a good box. The alternative is to look for empty cigar boxes online. Fa Find Amazon seller with a good reputation, particularly if you contact them before making a purchase and let them know exactly what you want. Get the biggest box you can, so you can fit several cigars inside when you are finished. A 50-cigar box is ideal, as it has plenty of space for humidity controllers. 2. Cut a piece of cedar plank to fit inside the bottom of your box. The fit shouldn’t be tight or even snug. You’ve completed your DIY cigar humidifier, but it’s not quite ready to use. Seasoning saturates the inside of the humidor with water so that it keeps your cigars fresh. 1. Do not make the mistake of wiping the interior with a wet cloth or rinsing it with water. This might damage the humidor! 2. Add a humidity controller to the humidor. Close the lid and leave it closed for at least 5 to 6 days. This process might take a little less time in hot weather, and longer when the weather is cooler. 3. When the humidity level reaches 65 to 70 percent, your humidor is ready to use! Remove the water and add your cigars. It takes just a few minutes to assemble this easy DIY cigar humidor. The time-consuming part of the process is finding the right cigar box for the job. Expect to spend at least $10 for a good cigar box and another $10 or so for Spanish cedar, depending on the source. If you purchase a large vintage cigar box, you’ll pay more – but you may like the finished results better. If you’re not worried about appearance, you can easily make a cigar humidor with a plastic storage box. The process is exactly the same as creating a DIY humidor with a cigar box. To make a “tupperdor,” simply cut a piece of Spanish cedar plank to fit inside the bottom of the box, add humidity controllers, and give the cedar about a week to reach the appropriate moisture level. You can add a digital humidity monitor as well. This is nice, but not necessary. We hope you enjoyed this quick guide to building a DIY humidor! If you happen to have access to a woodshop, and you possess high-level woodworking skills, you can build a beautiful heirloom-quality cigar humidor with Spanish cedar. 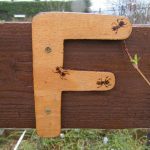 In fact, Fine Woodworking has an excellent video detailing the entire process. Step by step instruction for crafting a fine humidor can be found in this printable PDF, also from Fine Woodworking.